Going on right now at the The Rap Sheet is an ongoing celebration of the blog’s first year online. The party consists not of frivolities, but the serious matter of books forgotten that should not be. At least a hundred contributors are offering their selection of ONE book each that they’d like to recommend to save from oblivion. As you can imagine, the selections run the gamut from old to new, cozies, hard-boiled, spy novels, the works. If you can’t find something to catch your eye among the list of books selected, you’re reading the wrong blog, that’s all I can say. It’s a spectacular display of mystery wisdom and knowledge, there’s no doubt about it, delivered with grace and panache. ONE crime/mystery/thriller novel that I think has been most unjustly overlooked, criminally forgotten, or underappreciated over the years? I started to think about this and my brain froze. Overload. But how about this one? Well, any of WILLIAM CAMPBELL GAULT�s early books will do, those he wrote between 1952 and 1963. His second career began again in 1980, and I confess that I haven�t gotten to any of those yet, but I will. Pick one. How about his first one then? DON�T CRY FOR ME is the title, and it�s one of his non-series, non-PI books. The leading character is Pete Worden, ex-football star and the scourge of his family, cut off by his brother from his inheritance for his low-life, lack-luster attitude and approach to living. Invited to a crime boss�s party, he wins a bundle of cash at a dice game and ends up knocking out one of the losers. He later finds the guy waiting for him in his apartment, dead, with a knife in his throat. Gault�s usual complaints about the differences between the moneyed class and the rest of California society are in full force in this book, in his usual light but curmudgeonly way. But it�s not only the clash between classes that concern him. It�s also the fracture that exists between the educated and not, literature vs. pulp fiction, and wedges that occur even in families and pitting brother against brother — prime examples being Pete and his straight-and-narrow brother John, paired off and contrasted with the crime boss�s two youthful sons, with the surgical precision of a natural-born writer highlighting the differences between them. Cynical and sour in general motif, maybe, but it�s also one heck of a detective story. 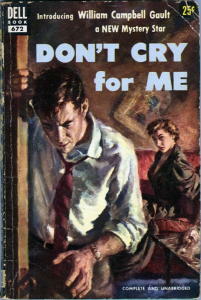 It won the Edgar for the Best First Mystery Novel in 1953.